Rock and metal fans, get ready, because this year, a brand new touring beast of a festival hits the road – and it looks like a force to be reckoned with!! 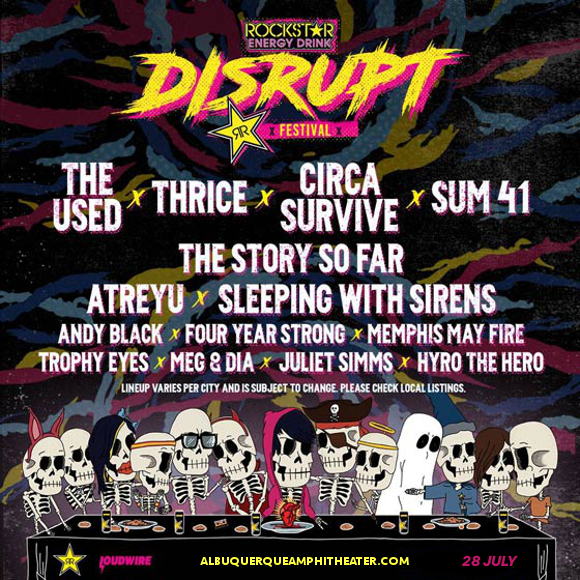 Rockstar Energy Drink presents the Disrupt Festival – featuring a lineup that includes The Used, Thrice, Circa Survive, Sum 41 and Sleeping With Sirens! This incredible touring one-day-festival is coming to the Isleta Amphitheater on Sunday 28th July 2019 – don’t miss it!! Tickets are on sale now and likely to disappear quick – get ‘em while they last!! One of the festival’s big names, The Used, released their last record “The Canyon,” in 2017. It’s a dark record, one inspired by heavy themes of drug addiction, depression and suicide, and in so creating it the band hope to reach out to any fans who might be affected and help them feel like they aren’t alone. “When you understand that you’re not alone in thinking about the huge, complex, philosophical questions in life, it might be easier,” singer and lyricist Bert McCracken said. “Every human at some point will have to lose someone close to them. I’m a translator. I’m just trying to give. This is the only way I know how to give. The Used are scheduled to release the “Live from Maida Vale” EP, their first record to feature new guitarist Joey Bradford, on Record Store Day, April 13th. But that’s just to whet fans’ appetites – a new full-length studio album is also in the works, and promised for release by the end of the year. If we’re lucky, they might just play a few never-before heard songs during their 2019 tour! Well, what are you waiting for?? Get ready to see The Used and many more live – tickets on sale now! !